Time to get out of the office! It's the moment you've all been waiting for... The Bryant Park lawn will open to the public for the first time this year on Friday, May 10 at 12:30pm. We know it’s been frustrating to watch Bryant Park’s lawn grow green and lush without the ability to walk on it and feel the freshness of spring. Your patience, for which we thank you, is about to be rewarded because the wait is almost over. Come early next Friday to watch the ropes come down, and then stay to enjoy live music, lay in the sun, and soak up the Spring. The Bryant Park Jugglers will also join us for a special extended Juggling session. So get out of your desk chair and bring your lunch, your book, and your friends to Bryant Park. Live ragtime and jazz music will be brought to you by The Gelber & Manning Band, a musical vaudeville quartet. As the big day approaches, we want to see how you capture the lawn. 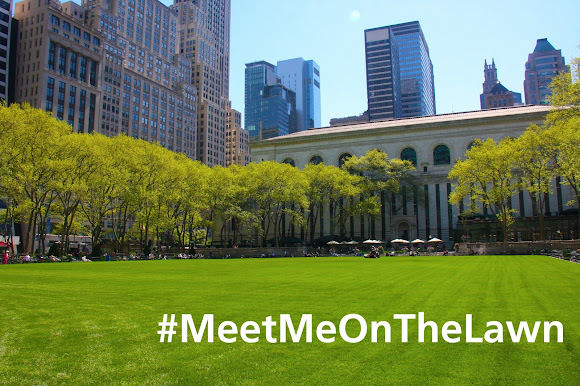 Post your best photos of that emerald green to Instagram with the tag #MeetMeOnTheLawn and @BryantParkNYC. The most creative, greenest, most lawn loving picture will win a BP Shop goody bag. Submissions will be accepted through Thursday, May 9 at 11:59pm EST, and the winner can pick up their prize on Lawn Opening Day. What has been taking so long anyways? Our lawn is made of Fescue/Kentucky Bluegrass sod cut from a farm on Long Island. We always give the fresh sod time to root properly in the Spring, so it can withstand the amount of traffic it endures through a standard Bryant Park summer. Grass with longer roots is able to hold water longer, which allows the grass to be more stress tolerant, stay greener, and last longer. This year we encountered a few more setbacks than normal. We had a late snow, and an unusually cold Spring, so the grass growth did not pick up as early as we would have liked. Nevertheless, the sod has finally come together, and we're ready to open. We look forward to having you enjoy our lawn on Opening Day and throughout the season. I'm so excited for the lawn to open. It's one of my favorite places in NYC during the summer. Is yoga not happening this year? Bryant Park yoga is the best outdoor class in the city. Please, please, pretty please don't cut it out! Hi Becky, Yoga will be back. We are still working on finalizing the dates. It will likely begin in June, and we will post info on bryantpark.org as soon as we know!